Paul van Zyl is a human rights lawyer and ethical fashion entrepreneur. He grew up in South Africa during the apartheid era, and served as the Executive Secretary of South Africa’s post-apartheid Truth and Reconciliation Commission from 1995 to 1998. Clare interviewed Paul in 2014 for her book Wardrobe Crisis. KIND. One of Maiyet’s early investors was social entrepreneur Daniel Lubetzky, founder & CEO of KIND, a not-only-for-profit snack food company. He founded an independent organisation called Feed the Truth, which seeks to improve public health by making truth and transparency the foremost values in today’s food system, and in 2015, Barack Obama named him a Presidential Ambassador for Global Entrepreneurship. ARTISANS are skilled craft workers who make or create things by hand. THE CONDUIT is a “new home for social impact” located at 40 Conduit Street, Mayfair. 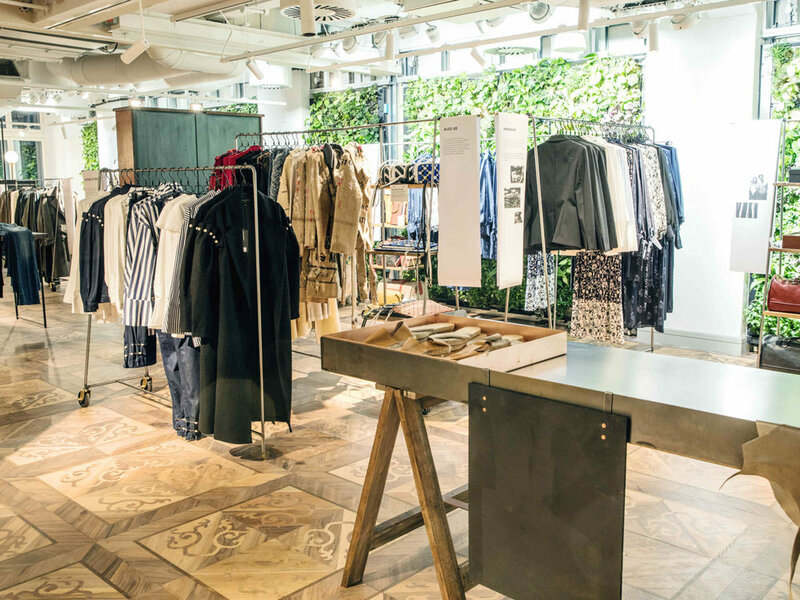 THE MAIYET COLLECTIVE is a pop up store, offering a curation of sustainable and ethical luxury brands on a rotational basis. It includes ready-to-wear, fine jewellery, beauty, home and lifestyle products with a shared vision for a just and sustainable future. They say: “We believe in the power of collaboration. Through our collective voice, we aim to educate, inspire and create a community of people who are committed to changing the way we think, create and acquire fashion.” The space also features a champagne bar and a cafe serving a locally sourced lunch menu. At the December event in London recently, designers included Bethany Williams, Alice Lee, S Dress and jewellery brand Eden Diodati and bags by Caroline Wong. CROSBY ST is the NYC home of the Maiyet Collective. “CHANGE AND DISRUPTION is either a disaster or an opportunity,” says Paul. 10 years ago the path to a brand being successful was very different. WARBY PARKER is a socially conscious, affordable eyewear business founded by four friends, Neil Blumenthal, Dave Gilboa, Andy Hunt and Jeff Raider, who met in business school. Let’s just say they’re VERY successful. Read why here. THE OLD FASHION SYSTEM IS BROKEN says Paul. Seasons that don’t align with consumer needs or desires or even the weather. Relentless pace. The antiquated wholesale system that requires brand to churn out full collections or melt into oblivion. Sale culture. Unethical production. Unreasonable expectations on creatives and makers. It’s time to design a new one, one that can be flexible, sustainable and fair, and can mitigate against over-production. One that’s collaborative. Maiyet Collective is one creative solution. It will take many more. CASHMERE. The devaluing of cashmere by fast fashion companies and supermarket chains has led to the desecration of the Mongolian grasslands from over-grazing. “Historically, cashmere has always been luxurious. Cashmere has been aspirational. Cashmere has been timeless. Cashmere has been an investment. But in the last decade, cashmere has been "disrupted" much in the same way that eyewear or fine jewelry or skin care have,” via Fashionista. Read the full story here. David McCann is the VP of COLORZEN, a company that has figured out how to dye cotton using way less water. For the full story, listen to Episode 58 with Katrin Ley.